The Future Of Philippine Stock Market Seen To Hit 8,000 Mark This Year 2015, Are You Going To Wait? You Can Decide Now! Hi, there once again. If you're reading business news about the Philippines today, particularly about the stock market, you may probably noticed that our country is doing well. Stop reading comics and entertainment section kasi, para nalalaman mo. Kidding. Because of the Pope visit? I don't know. Maybe not. Because of oil cuts in the middle east, possibly yes. Because of the positive outlook of the investors about our economy? No doubt about the boost of our economy, hopefully this will continue up to whoever will take placed Noynoy. My fearless prediction, this will go up. There maybe sometimes that we are seeing slight down movement, but definitely in a long run, Philippine stock market will go up. Yes, I will start learning stock market investing today. Going back to the business news, let me share to you the news a read from business.inquirer.net, please read also some excepts below. "THE LOCAL stock market index will likely chart new highs, breaching the 8,000 mark this year on ample liquidity and benign macroeconomic fundamentals especially with falling oil prices, stock experts said yesterday. Sun Life of Canada sees the Philippine Stock Exchange index hitting at least 7,800 to as high as 8,000 this year, supported by expectations of higher earnings alongside a surge in liquidity from cash-awash investors, while funds flow out of Europe and Japan where central banks are pump-priming the economy. 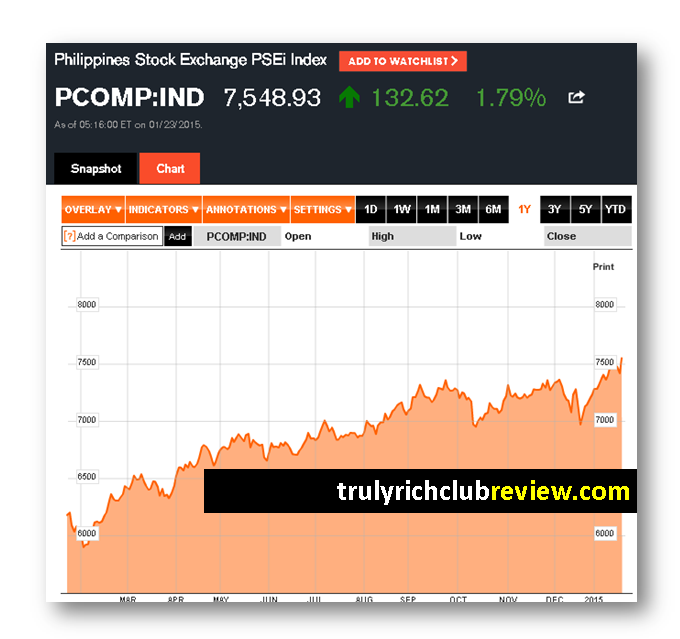 COL Financial, on the other hand, upgraded its PSEi forecast for 2015 to 8,300, from 7,800, as the country’s leading online stock brokerage factored in a lower-than-expected interest rates. “The resulting drop in interest rates makes stocks more attractive compared to other liquid investments despite the PSEi’s relatively expensive valuation from a historical perspective,” COL head of research April Lee-Tan said in a briefing Thursday. Lee-Tan also cited the effect of the drop in oil prices on consumer spending, while the country would start to reap demographic dividends this year as more young people reach productive age. At the same time, she said, there are expectations that reforms to address shortcomings in the country would endure beyond the current administration. COL also expects corporate earnings to grow by 16 percent this year compared to only 6 percent last year."